Gorbel Ergonomic Work Station Bridge Cranes can handle the toughest overhead lifting tasks. 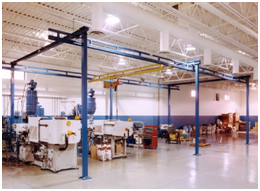 Workstation Cranes are available in FREESTANDING and CEILING MOUNTED designs. Gorbel Free Standing Cranes, which can be installed on any normal 6-inch reinforced concrete floor, feature a pre-engineered, modular design that can easily expand as your work centers expand. Available in Steel, Stainless, Steel, and Aluminum. Enclosed track cranes are up to 3X easier to move than traditional bridge cranes. The design virtually eliminates dirt and dust from the rolling surface. This reduces wear on the wheels of the trolley and end trucks. The smooth running surface reduces rolling resistance. Easy to expand and relocate. Gorbel Workstation Cranes are a proven way to improve productivity, increase quality, reduce back injuries and provide a safer work environment. More and more companies are using Gorbel Bridge Cranes to effectively solve their material handling problems and improve the performance of their business. Increased productivity with Workstation Bridge Cranes help your workers work more productively than traditional I-beam cranes. A study conducted by the Human Factors Laboratory at Rochester Institute of Technology for Gorbel shows that work station cranes increase productivity up to 28 percent compared with I-beam cranes. The productivity increase is possible because bridge cranes require less effort to move than I-Beam cranes. 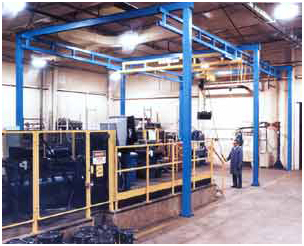 In most applications, particularly high cycle time applications, customers are able to cost justify the crane system with the productivity increases alone. Ease of movement and positioning - Gorbel Ergonomic Material Handling Cranes can move a load 3x easier than a traditional I-beam crane. This ease of movement and positioning results from Gorbels unique enclosed track design, high strength-to- weight ratio, and rigid runways with anti-binding end trucks. Increased Quality - Enclosed Track Cranes can increase the quality of goods while reducing the cost of damaged or rejected parts. Loads are so easy to move and position with workstation cranes, much of the damage that is done to the product during the manufacturing process is eliminated. Improved work force utilization - Gorbel Work Station Cranes can help you reach the typical ergonomic goal in material handling: Allowing a task to be performed by 90 percent of your workers. For instance, the Rochester Institute of Technology study commissioned by Gorbel shows that less than 10 percent of men can safely handle a 4,000-lb. load on a manual I- beam crane, but more than 99 percent can do so on a Gorbel Work Station Cranes. Modular Design - Gorbels Pre-Engineering Crane Kit design permits easy expansion or relocation. The runway length can be increased by adding runway sections, free standing support assemblies and additional bridges as needed. Better work force utilization - Since physical strength becomes less of an issue with Gorbel Ergonomic Workstation Crane, you can better utilize your work force. This is especially true considering that today's work force is aging, and it is becoming increasingly female.